The Burkini Ban Social Experiment: How Would You Respond? A young woman sits on a beach bothering no one, she’s there to enjoy the sun like those around her. But what she doesn’t know is she’s about to make headlines all around the globe. This young woman is wearing the burkini, a swimsuit designed to protect the modesty of Muslim women who wish to go to swimming or have a day out at the beach. The moment that went viral and sparked outrage occurred when this young woman was approached by an armed officer who told her she had to remove her burkini and stood watching as she did so. The embarrassing encounter was captured and online within minutes where social media debated the issue. What’s important to note is that nobody on the beach seemed to speak up or stand up for the young woman. People got out their phones and captured the moment for a few minutes of social media fame rather than stepping in to try and ease the situation. The question of what would we have done if we were there is one many posed online when the story first broke and is one a group of people from the U.K. have attempted to answer. Posting to Trollstation on Facebook a group of young people conducted a social experiment to see if people would step in if the situation occurred in the U.K. 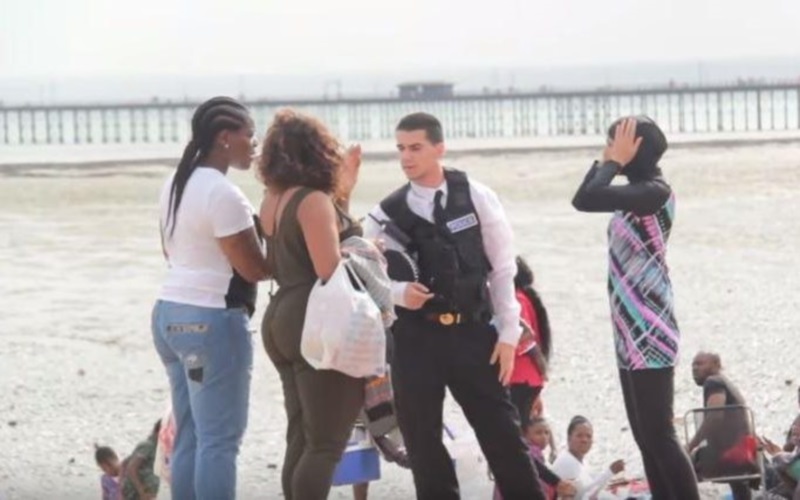 The video begins with a similar narrative to that in France, an officer asking a young woman to remove her burkini; but that’s where the similarities end. Once those around them got wind of what was taking place, people began to step forward and reprimand the officer for attempting to police what women wear. In fact the outrage came so fast, those conducting the experiment had to quickly reveal that it was for show in an attempt to diffuse the situation. Now while the video does seem to restore a little faith in humanity we must remember it was false and conducted in a country which does not have any anti-burqa or burkini laws; whereas the situation in France is vastly different. We cannot think we are better than France simply because of this one video as we currently have some U.K. Independent Party Members of Parliament calling for a burqa ban. This religious discrimination cannot become normalized and we mustn’t allow ourselves to become so desensitized to issues like this that we don’t step in if they occur in our areas or to those we know. In France, the social media outrage spoke volumes, but the silence of those around the young woman was telling. This hatred and misplaced fear manifests until situations like this become the norm, until Muslim women feel they cannot partake in certain activities for fear that they will be treated the way this young woman was. This cycle of fear and ignorance won’t end until people step forward when they see the mistreatment of others. So while the burkini ban social experiment in the U.K. may ease our minds for the time being, we cannot forget that the situation in reality did not play out like its staged counterpart. The young woman didn’t get to look into the camera and inform us she’s really okay. Instead, she left humiliated and with the knowledge that the world has seen her in a way she never wished to be seen. Since When Is Your Belief System the Sole Representation of Islam?